This makes a large pot, perfect for tucking a container or two into the freezer. Just don't add the pasta to the soup pot; instead, cook it separately and add it to the thawed soup. 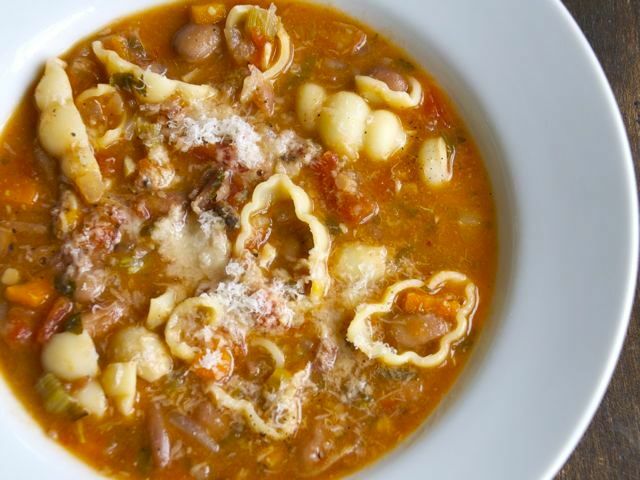 I adapted this Pasta e Fagioli from the [%bookLink code=067945957X "Rogers & Gray Italian Country Cook Book"]. Soak the beans overnight in a large saucepan. When ready to cook, pour off the soaking liquid, then cover the beans with fresh water, 2 inches over the top of the beans. Bring to a boil, reduce to a simmer, and cook partially covered just until the beans are done (tender but not mushy; cooking time will depend on your beans). Turn off the heat and set aside. In a large stockpot, add enough olive oil to cover the bottom. Sauté the chopped onions, celery, and carrots over medium heat until the onion is soft. Add the garlic, chile pepper, rosemary, parsley, and bacon. Sauté, stirring, until the bacon is cooked through. Add the chopped tomatoes with their juice and continue cooking, 20 to 30 minutes. Meanwhile, in a blender purée half of the cooked beans with a little of the cooking liquid. Add this purée, along with the rest of the cooked beans, to the stockpot. Adjust the liquid — adding bean broth and/or water — to the consistency you like. Season to taste with salt and pepper. Bring a separate pot of salted water to a boil. Cook the pasta — a handful per person if you are not serving the entire amount in one sitting — until al dente, following the package instructions. Drain. Serve by scooping a large spoonful of pasta into each bowl, then covering with soup. If you like, garnish each soup bowl with freshly grated Parmesan. Read Carrie Floyd's Kitchen Limbo column about planning meals around a pot of beans.